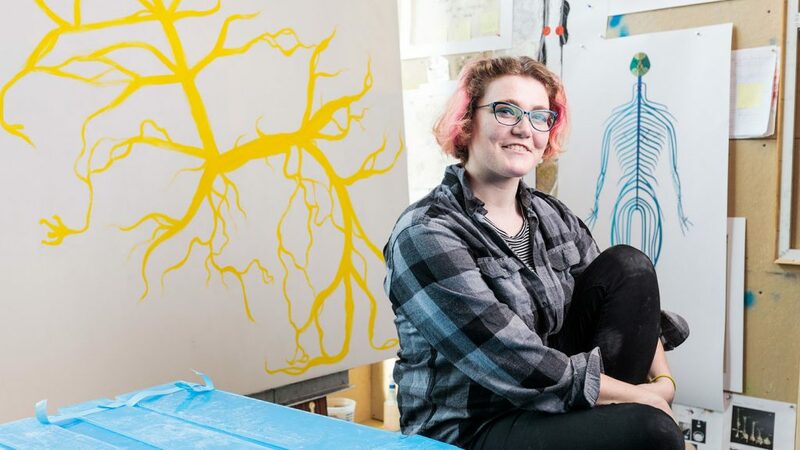 Megan Mauriello ’19 was a biology major when she took Beginning Painting with Ed Kerns, Clapp Professor of Art. 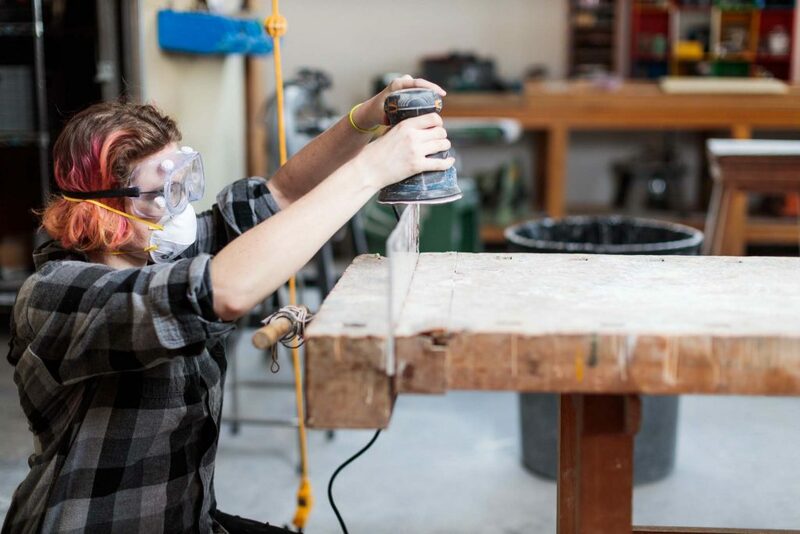 Although Mauriello aspires to have a career in scientific research and never considered herself an “art person,” the course sparked her interest in taking on an additional major: art. 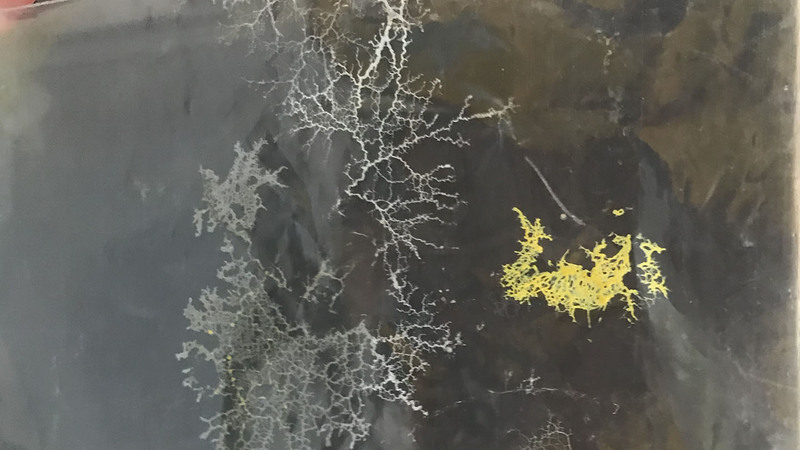 Mauriello, a biology and art double major, paints patterns she observes in her slime mold. 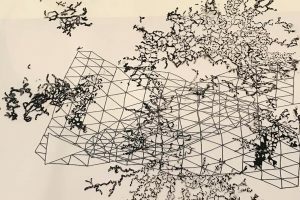 But Mauriello had heard about students who produced cross-departmental work and decided that was how she could approach biology and studio art theses. 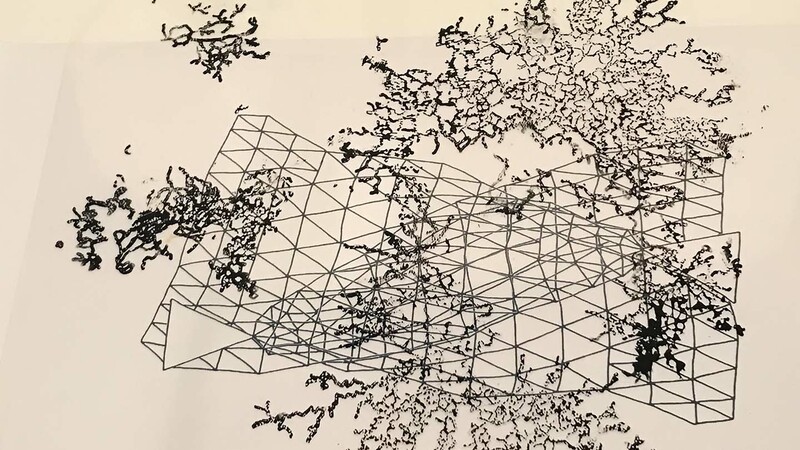 Mauriello had worked with microbes before and thought that using a life form could be a way to create a body of work for her art thesis. 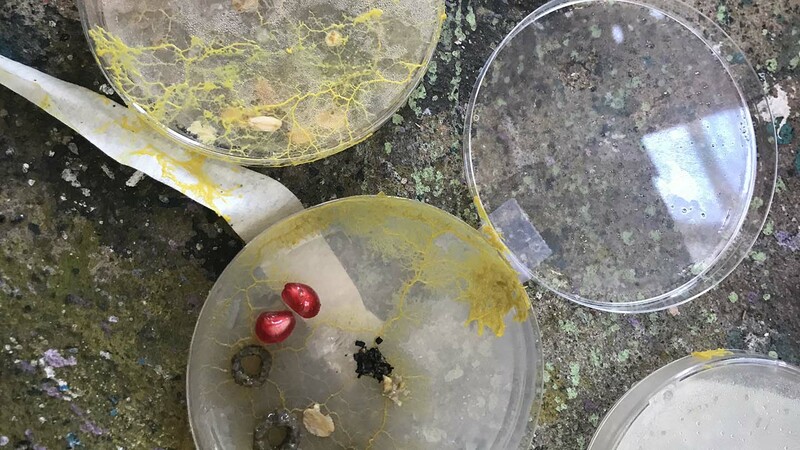 The project, which has been selected for presentation at the National Conference on Undergraduate Research, is in the works, and Mauriello is experimenting with how she can influence the growth of slime mold to do two things: research the life form from a biology standpoint and create art from it. 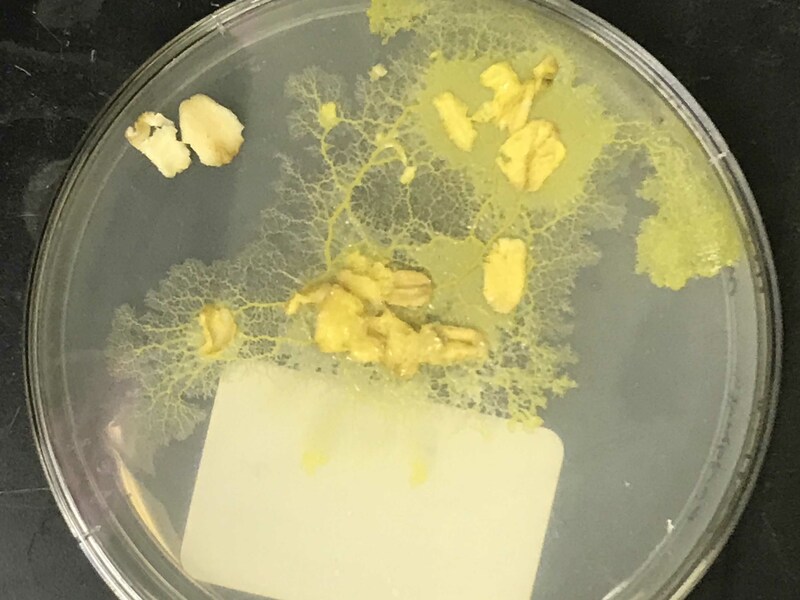 To do this, Mauriello is studying slime mold’s food preference. She’s learned it seems to be repelled by whole bacteria; it literally moves away from it. 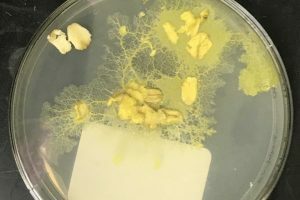 However, in some cases, if a bacterium has started to experience lysis—the breakdown of its cell membrane—the slime mold moves toward it, suggesting that it might prefer a food source that’s dying or dead, Mauriello hypothesizes. 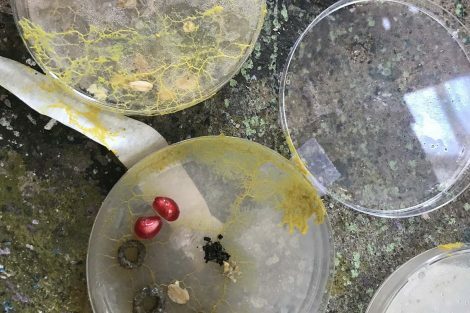 From this, she can use food to influence how slime mold grows, thus creating art. “I’m really trying to use the organism itself as a medium, as opposed to drawing a pattern and having it grow on a canvas or paper,” she says. “This is a very difficult thing to do, but I’m slowly moving in the right direction. Just like the slime mold she’s studying. Mauriello sands clear plexiglass to be used as a petri dish. Mauriello also is looking forward to the conceptual aspect of her double thesis. 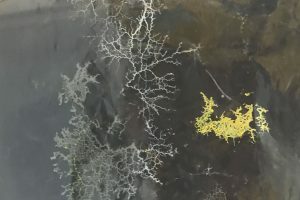 Slime mold doesn’t have a central nervous system, but it’s capable of learning. For example, it doesn’t like having gusts of air blown at it, explains Mauriello. It will change its growth pattern to avoid it. Below, see images and learn more about Mauriello’s research. A preliminary experiment to see if Physarum is attracted to pomegranate: "There are some pomegranate seeds and plain Cheerios, which were soaked in pomegranate juice, and I hoped that the organism would pick up the color of the juice (plate on right)," says Mauriello. "It did not, but what it did do was climb (via the tape holding the stack of plates together) to the plate on the top of the stack, which had oats in it (plate on left)." A plate with growth and oats: "Most of these pictures show yellow growth, in which the organism is viable. 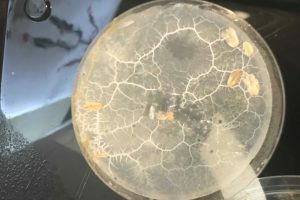 This growth is white, meaning it is not viable, but more or less a trail the slime mold left behind." "Some unexpected growth on a plastic bag, which was in the same container as the plates. I'm using tracings and scans of this pattern to make artwork." 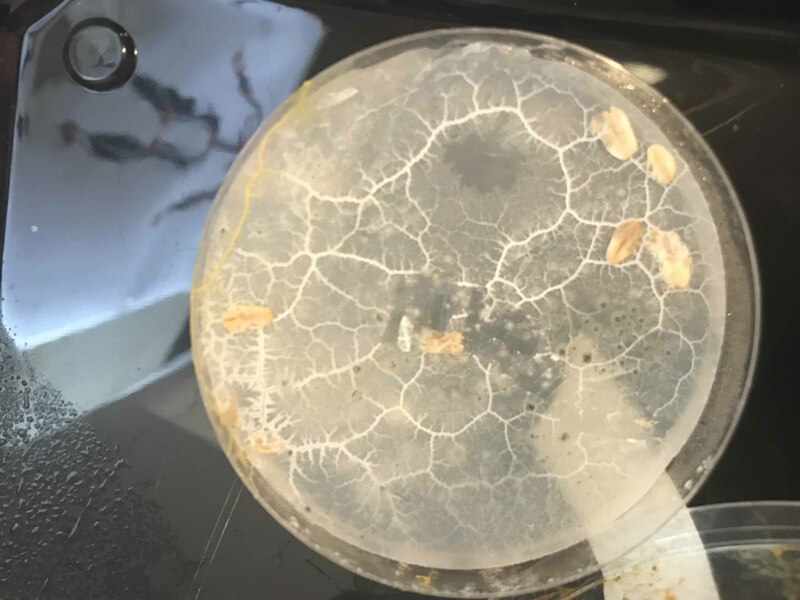 This shows slime mold growth on a plate with oats. Here, Mauriello experiments with layering transparent prints of Physarum growth on different papers.